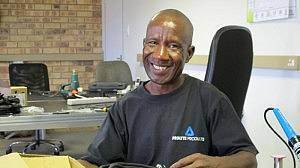 Philimon Maepa heads the cabling department at DWR Distribution and is an expert at producing distro boards. With a background in electronics, Philimon joined Calite and became part of the entertainment industry in 1993. Calite was a supplier of lighting equipment gear. “We used to go out and do many installs in Botswana, Namibia, Cape Town and all around the country,” Philimon remembers. What many people don’t realize is the intricacy required when making up distribution boards. Philimon builds the units from scratch, not to mention all the wiring this entails. The work is repetitive yet requires immense concentration. Through example, Philimon motivates his team to constantly produce equipment of the highest standard. A father of four, Philimon enjoys spending time with his family.